She is easily identified by the numerous battle and mating scars down both sides of her immense body. When we spotted Sarah in 2013 it was amazingly exactly 2 years to the day since we last saw her in 2011. 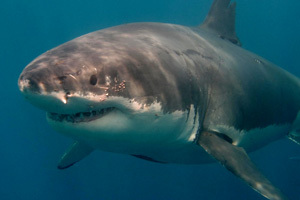 Gestation for a female white shark is 18 months and studies have shown that once these animals leave Guadalupe around late December they travel vast distances along the Pacific coastline to both feed and give birth. If the theory is correct we have a great chance of seeing Sarah for years to come, perhaps exactly to the day once more! When she visits the boat she is often very cool and composed moving slowly through the water in a particularly calm manner. This behavior around the cages is not uncommon amongst the mega-sized sharks. 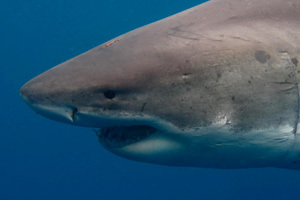 They have an air of confidence about them but at the same time are often less interested in us than many of the younger, smaller, more boisterous sharks. 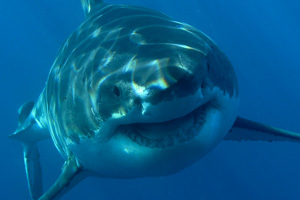 Share the Sarah the shark love on Facebook! Want to meet Sarah? Book with Shark Diving Xperts today!